An intelligent ape from the far future leads an Army of monkey servants in a revolt against their human masters. The fourth film in the Planet Of The Apes series features the most explosive subtext of any film in the series, and a sleek, futuristic production design. Followed by Battle For The Planet Of The Apes. With 1972’s Conquest of the Planet of the Apes, the series continues with its fourth film. Set in the then future of 1991, this one takes place about two decades after the events in Escape from the Planet of the Apes. When that flick concluded, some humanoid chimps from the distant future ended up dead and the authorities thought they’d killed the couple’s similarly advanced infant. Instead, circus chief Armando (Ricardo Montalban) took the baby under his care and watched after him for the next couple of decades. We meet up with Armando and an adult Caesar (Roddy McDowall) as we see how society changed over those years. As the apes told the humans in Escape, a virus killed all the cats and dogs so people took apes as pets. They became more social and advanced, so by the movie’s 1991, apes act as menial workers. We see them wait tables, deliver messages, clean floors and other tasks of that sort. For all that time, Armando passed off Caesar as any other ape since knew that if the authorities found out that the offspring of Zira and Cornelius lived, they’d kill the critter. Unfortunately, when ape maltreatment angers Caesar, he reveals his ability to speak, and the government interrogates Armando. Governor Breck (Don Murray) notes how the servant apes have shown increasing signs of resentment and potential rebellion, so he frets that a more intelligent, talking beast could lead an all-out revolt. And for good reason, since that’s what eventually happens. Of course, the humans bring this on themselves via their poor treatment of the apes, but the people doesn’t see this. Caesar enters the general simian society at Armando’s order; he pretends to be newly-arrived and goes through basic training. There he sees abuse first-hand before he decides to do something about it. The movie follows the battle between ape and human as Caesar leads a burgeoning revolt. Even with all that knowledge, the authorities let it happen anyway! They fret about how the presence of one of the talking apes will doom humanity but don’t concern themselves with the path that they know will ultimately allow the simians to prosper. Apparently they enact minor precautions via a fascist police force that ensures the apes don’t spend much time with each other, but they totally ignore the basic genesis of simian evolution. Am I the only one who thinks this seems idiotic? Even if I ignore to stupidity of the humans, Conquest proves unsatisfying due to its heavy-handed moralizing. Ever since the original flick, each Apes movie featured some obvious social points. Conquest takes that to an extreme with its glaring comparisons of the apes to African slaves in early America. 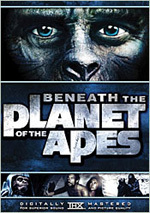 The movie examines the simians in exactly the same way and doesn’t leave much room for interpretation. This is probably the least subtle of the first four Apes films, and I don’t see that as a good thing. The film beats us over the head with its ideas and fails to allow us to think for ourselves. What could have been an interesting exploration of the subject turns ponderous and pedantic. The story feels like little more than foreplay to introduce an excessively long and not very interesting climax in which ape battles man. 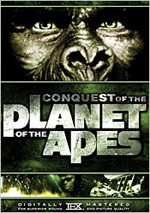 Conquest of the Planet of the Apes appears in an aspect ratio of approximately 2.35:1 on this single-sided, double-layered DVD; the image has been enhanced for 16X9 televisions. Though generally good, the picture was the weakest of the first four Apes films. Most of my complaints related to dark scenes. Black levels tended to be too dense and impenetrable, while low-light shots were often tough to discern. These seemed heavy and thick even in shots that shouldn’t have been particularly dark. Sharpness also took a few hits. Though still mild, edge enhancement was more prominent than during the first three movies, and this rendered wide shots as somewhat soft. Still, the majority of the flick was accurate and concise. No issues with jagged edges or shimmering occurred. Source flaws remained very minor. I noticed a blemish or two but nothing else marred the presentation. Conquest continued the natural palette of Escape and looked consistently fine. The colors appeared bright and lively throughout the film. Despite a few issues, this was a mostly positive image. As for the Dolby Digital 5.1 soundtrack of Conquest of the Planet of the Apes, it also was satisfying though not quite as pleasing as its predecessors. My main problem connected to the scope of the soundfield. Music played too prominent a role, as the score tended to pop up awfully loudly in the rear speakers. This didn’t appear logical or natural, and it made the music less appealing. Audio quality was perfectly fine for an older flick. Speech seemed natural and concise, and effects were accurate as well. Those elements showed reasonable depth and precision. Music may have been too prominent, but the score sounded good, as those aspects were pretty robust. Overall, the audio worked well. Only a few minor extras fill out the DVD. Cast simply lists the names and roles of some actors. There’s no biographical information included. What’s the point? 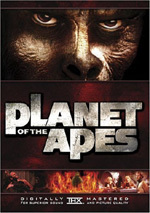 Theatrical Trailers features ads for Planet of the Apes, Beneath the Planet of the Apes, Escape from the Planet of the Apes, Conquest of the Planet of the Apes, Battle for the Planet of the Apes, the 2001 Planet of the Apes and a “Planet of the Apes Crosspromotion” that touts the first five films. So far the Planet of the Apes series has suffered from a Star Trek-like even/odd curse. Films 1 and 3 were pretty good, but movies 2 and 4 are mediocre at best. Conquest of the Planet of the Apes meanders and exists as little more than an excuse for its big end battle. It lacks the charm and insight of the better Apes efforts. The DVD presents good picture and sound but lacks notable extras. Leave this one for Apes diehards. A purse-strings note: you can buy Conquest of the Planet of the Apes on its own or as part of a six-DVD Planet of the Apes Legacy boxed set. That package includes Conquest along with the original Planet of the Apes, Escape from the Planet of the Apes, Beneath the Planet of the Apes, Battle for the Planet of the Apes, and the documentary Behind the Planet of the Apes. Fox presents Conquest solely in Legacy and the super-duper $180 Planet of the Apes Ultimate Collection, though Image Entertainment produces a two-disc version on its own. For fans who want all the movies but who are not eager to shell out the big bucks for Ultimate, the Legacy set is a nice bargain. Separately, the five movies list for about $75, while the Legacy retails for $50. Toss in Conquest as well and it’s a nice set for Apes fans.